The ToughBuilt® 30" Massive MouthTM Specialist transforms how professionals carry tools and supplies. The patent pending opening is wider than anything on the market for superior accessibility. Comes with padded shoulder strap, and side handles to carry the heaviest loads. The unique octagonal shape with rigid plastic HardBodyTM lining protects everything inside and keeps its shape. Comes with a lockable zipper for security and safety. Its 65 versatile pockets and loops include a covered notebook pocket, structured external pockets that flex to securely hold tools in place, and durable zippered mesh pockets for visibility. 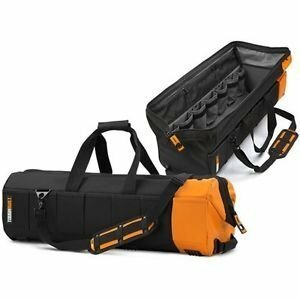 Made with high-quality, rugged materials and heavy-duty rivet reinforcement, this hard-working bag keeps up with the professional's rigorous demands.